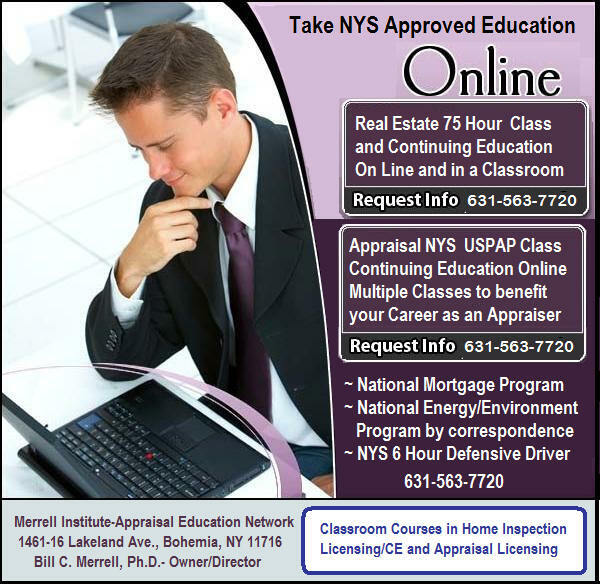 Over 28 Hours NYS On-Line Appraisal Continuing Education! Appraisal- NYS Approved Continuing Education NYS, Dept. of State Approved- Approval codes Listed! AND AN ORIGINAL SIGNED SIGNATURE FOR MEET NYS STATE CONTINUING EDUCATION REGULATIONS! WE ARE NEW YORK STATE APPROVED FOR NEW YORK STATE APPRAISERS ! Certificates will only be issued when student meets all educational requirements, including content and course completion. We will issue certificates to verify completion of each course. Hondros College will notify the Appraisal Foundation of your successful completion of the 7 Hour USPAP Mandated Course. Our school will mail you each certificates as you complete each course. We will automatically send it to the address you have provided us with when you enrolled! Questions about the classes? Call us at 631-563-7720. If we are not available, we will call you back promptly. Have a great day, and we hope you enjoy our approved on-line courses for NY State! Technical Support for each course- including paying for the class on-line, log in support, screen issues, etc. Questions, Call us. We will ask your name and address to make sure you receive our newest brochure if you wish to attend courses in class. go to our web site if you wish to take on-line classes.